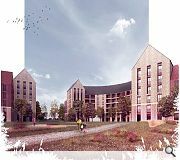 Sanctuary Homes and Collective Architecture have worked up proposals to replace a high-rise housing estate to the north of Cumbernauld town centre. 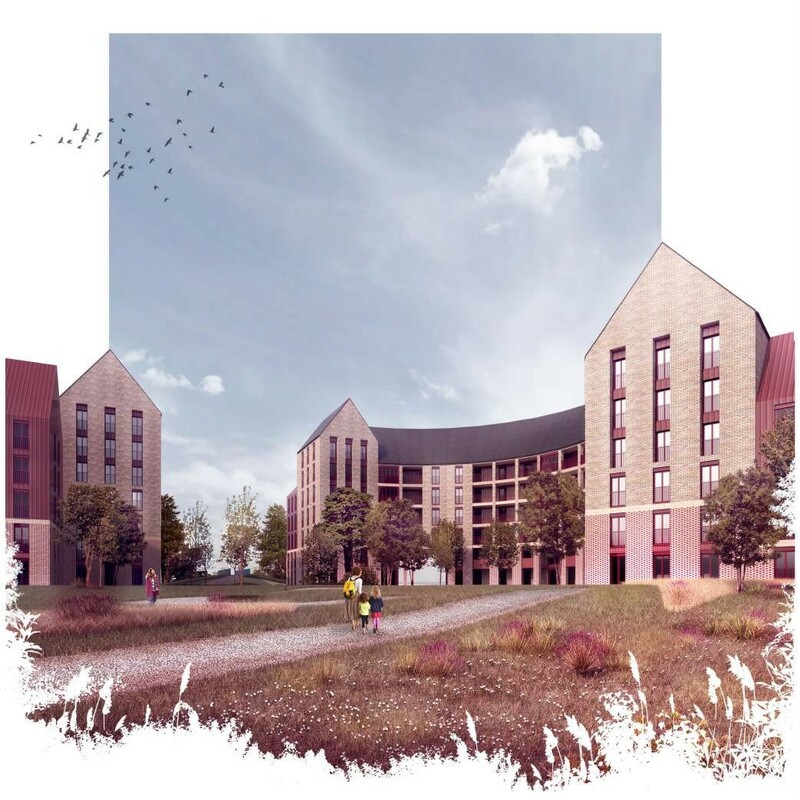 Burns Road, Kildrum, is currently occupied by three tower blocks and a multi-storey car park, all of which is due to be swept away later this year as part of wider plans to move away from high-rise housing. The proposed scheme will retain a landscape belt of parkland and trees, replacing current housing with 136 new buiold flats focused on a central roundabout, bordered by a feature crescent bookended by feature red zinc gables. Documenting their planned approach in a formal planning application Collective wrote: “The proposed urban form creates distinctive nodes and vistas via zinc clad gable ends. 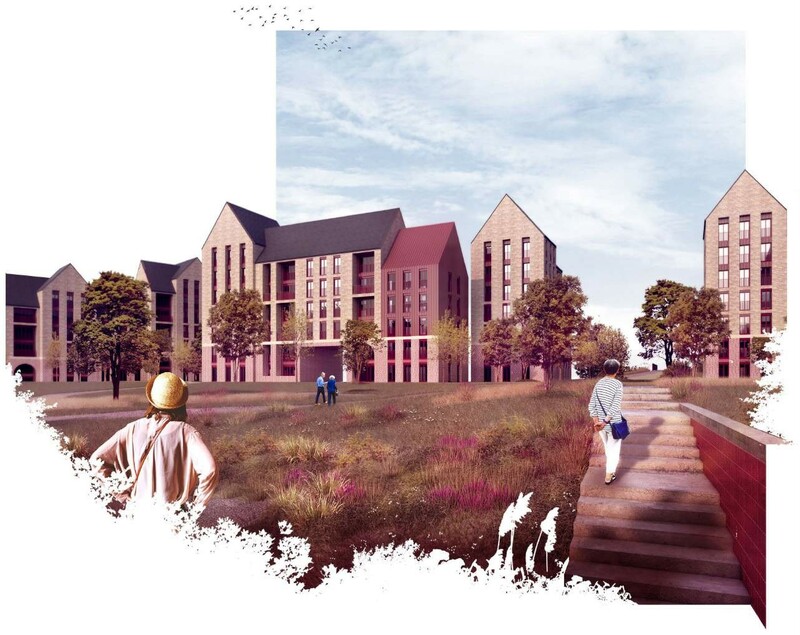 Responding to the steep and complex topography, the roof-scape of the development is varied. The pitched roofs of flats are alternated, celebrating the traditional Scottish gable form. 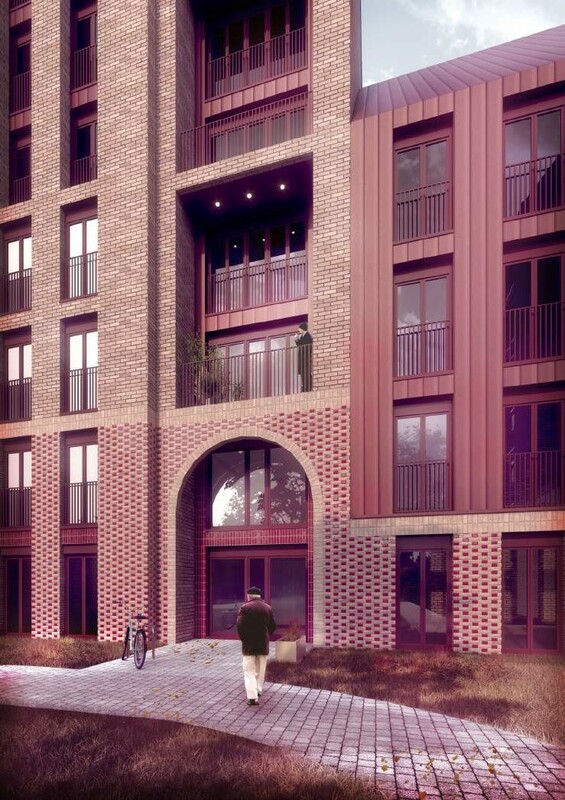 Finished in grey/light toned brick ground floor areas will be accentuated through the use of red glazed brick headers with full height recessed windows, arched entrances and balconies creating deep shadow details. These look a bit... odd. All about two storeys higher than is comfortable, lending it a stretched and slightly nightmarish quality. I know this site quite well. This looks like over-development to me. I can also see much of the "ornate" being value engineered out when Sanctuary get tender prices back. 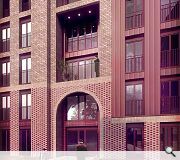 Nothing wrong with the scheme that already has planning permission on this site. For a "current article", it's out of date. I suspect it was written a couple of months ago, by someone not from the town, and only just now being posted. The 3 tower blocks and carpark now consist of 1 tower block. One was knocked down tail end of last year, and the other (and carpark) were brought down over the last few weeks! #5 The plans were only submitted last week, and demolition is as you've said is still ongoing. So it's very much in-date, bar some poor wording.